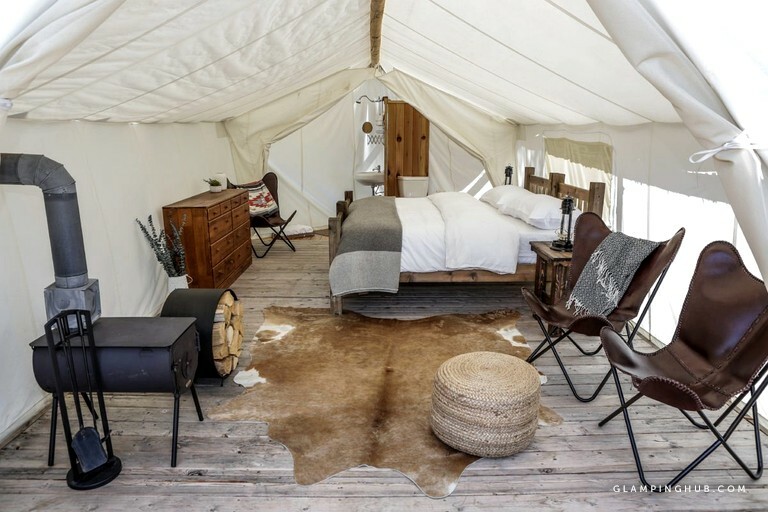 This luxury safari tent rental is located at a glamping site near Cades Cove, Tennessee, and can accommodate up to four guests for a Smoky Mountains getaway full of adventure and reconnection to the great outdoors. 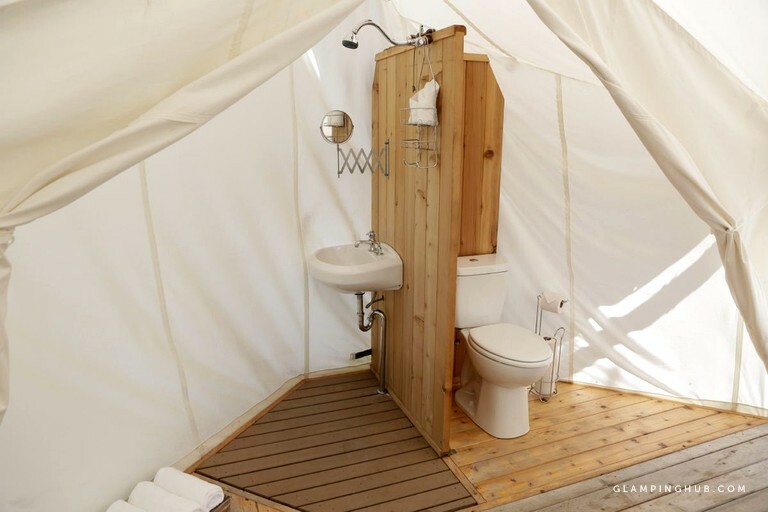 Inside the tent, guests will find a king-size bed flanked by bedside tables, a sitting area with a pair of leather chairs, a chest of drawers, a wood-burning stove, and an ensuite bathroom with a shower, a sink, and a flushing toilet. Luxurious linens, pillows, blankets, towels, shampoo, and body wash are provided. 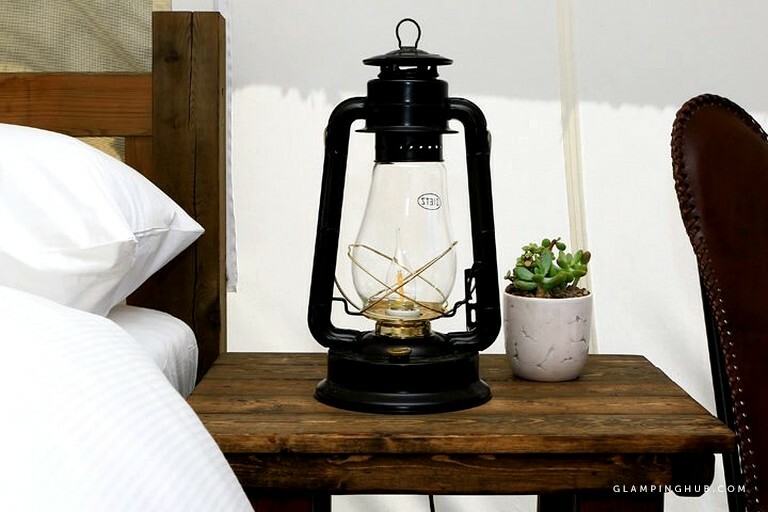 Other amenities include battery-powered lanterns that guests can use for lighting both inside and outside, as well as for charging electronic devices via USB plugs. 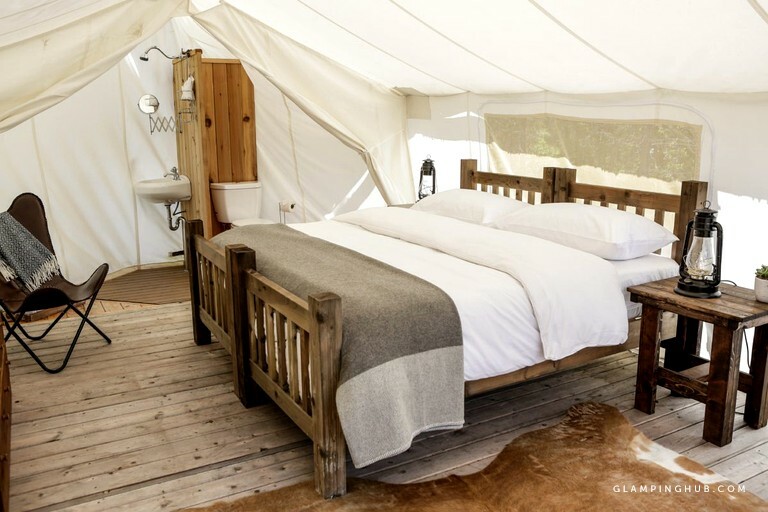 Guests will find a variety of shared facilities at the 200-acre glamping property in which the accommodation is located. For meals, guests will find an on-site restaurant that serves breakfast and dinner, with take-out lunch options available as well. Meals are paid for at the time of purchasing them. The site also provides guests with propane barbecue grills and basic cooking utensils so they can prepare meals for themselves. The grills are available to use for free on a first-come, first-serve basis. The site does not have electricity, but there are battery-powered fans and lanterns with USB plugs that will allow guests to charge at least two cellphones at a time. With advance request, a generator can also be provided for guests who need to bring CPAP machines or other electrically-powered devices. 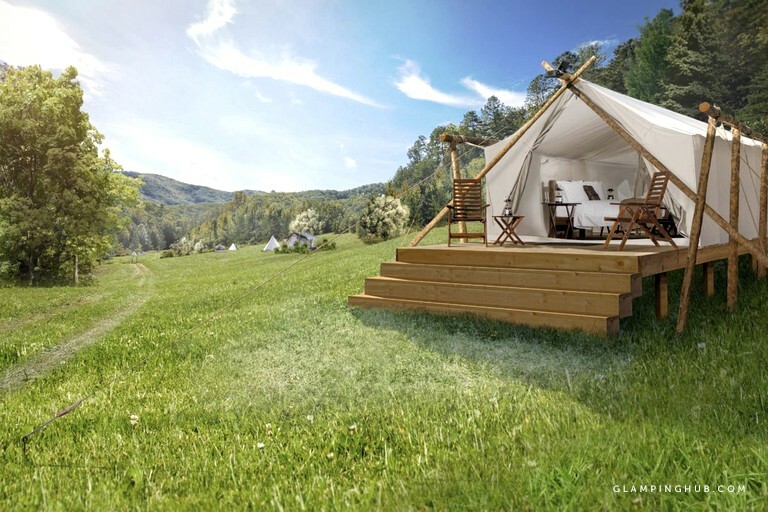 For parking, guests will find a central parking lot with footpaths leading to the glamping property. For guests with mobility issues, the staff can help them get from the one to the other with a golf cart. For guests staying at an accommodation without a private bathroom, there is a bathhouse containing six individual bathrooms, each of which is completely private and contains a flushing toilet, a sink, and a shower with hot water. The bathhouse is lit at night, as is the site's reception tent. The accommodation comes with lanterns that guests can use inside and outside. Otherwise, the campsite is naturally lit at night by the spectacular light-pollution-free sky above. Individual fire pits are not allowed for safety reasons, but there is a communal fire pit that is lit by the staff between 7:00 PM and 11:00 PM. Complimentary s'mores and roasting materials are provided. Complimentary sheets, pillows, blankets, sleeping bags, towels, shampoo, and body wash are also provided. Cribs, pack n' plays, and full-size camping cots are available as well. The cots can accommodate guests up to 6'2" in height and 300 pounds in weight. To start the day off right, the host serves breakfast with some lunch items available to go! Guests can relax and unwind in the evenings with the café-style dining options! All meals are paid for upon purchase. Guests can also enjoy a complimentary hot beverage anytime. This accommodation is located in Gatlinburg, Tennessee, where it is situated on a 200-acre glamping property surrounded by the verdant forests, rolling hills, and abundant wildlife of the Great Smoky Mountains. Just a few miles to the south, guests will find the Great Smoky Mountains National Park—a UNESCO World Heritage Site that encompasses more than 520,000 acres of mountains, valleys, and forests, through which wind more than 2,100 miles of streams and rivers and over 800 miles of trails, including a 70 mile stretch of the Appalachian Trail. Ranging from 876 feet to 6,643 feet above sea level, the park's mountainous terrain is covered with thick expanses of leafy deciduous forests at lower altitudes and coniferous forests at higher altitudes. These forests and the park's many waterways provide habitats for a rich diversity of wildlife, including more than 200 species of birds, 67 species of fish, 80 species of reptiles and amphibians, and 65 species of mammals. The latter span a range of creatures big and small—from chipmunks, bats, and river otters to bobcats, white-tailed deer, and black bears. Guests will find a number of trailheads nearby, including the Little Greenbrier Trailhead, Curry Mountain Trailhead, Cove Mountain Trail Trailhead, Hickory Flats Trailhead, and Gatlinburg Trail Trailhead. Moving further south into the park, guests can visit attractions such as Cades Cove and Clingmans Dome. At the former, guests will find prime spots for wildlife viewing, amid a lush valley surrounded by mountains. At the latter, they will find the highest point in the park, at the top of which there is an observation tower with incredible 360-degree views of the forest below and mountains beyond. The site is about 20 minutes from downtown Gatlinburg and 15 minutes from Pigeon Forge. In Gatlinburg, guests will find a variety of restaurants, shops, live music venues, and miniature golf courses, along with attractions such as the Gatlinburg Space Needle, the Hollywood Star Cars Museum, and the Ober Gatlinburg Amusement Park. A ski area is also accessible which offers a range of year-round activity options. With more than 800 miles of trails, 2,100 miles of rivers and streams, and a more than half a million acres of pristine natural environments to explore, Great Smoky Mountains National Park offers guests a range of outdoor activity options, including hiking, biking, horseback riding, fishing, rafting, scenic driving, and wildlife viewing. Nearby trails and trailheads include the Little Greenbrier Trailhead, Curry Mountain Trailhead, Cove Mountain Trail Trailhead, Hickory Flats Trailhead, and Gatlinburg Trailhead. For rafting, guests can go on trips with local outfitters such as Rafting in the Smokies and Smoky Mountain Outdoors. For horseback riding, guests can go on rides with Sugarlands Riding Stables and Smoky Mountain Riding Stables. The staff at the glamping site can help guests with planning and arranging activities. At Ober Gatlinburg Amusement Park and Ski Area, guests will find another host of winter, summer, and year-round activity options. In the winter, they can go skiing, snowboarding, and snow tubing. In the summer, they can play miniature golf and go on a variety of rides, including an alpine slide, a water raft slide, a chair swing, a scenic chairlift, an aerial tramway, and a mountain coaster. Throughout the year, they can go ice skating at an indoor ice arena, play games at the arcade, and see a variety of animals at the park’s wildlife exhibits, including bears, bobcats, river otters, and birds of prey. At Pigeon Forge, guests can visit attractions such as the Dollywood amusement park, the Smoky Mountain Alpine Coaster, SpeedZone Fun Park, and the Hollywood Wax Museum. They can also go golfing at the Gatlinburg Golf Course. For miniature golfing, there are a number of other options in both Gatlinburg and Pigeon Forge, such as Ripley's Davy Crockett Mini-Golf, Treasure Quest Miniature Golf, Fantasy Golf, and Professor Hacker's Lost Treasure Golf, in addition to the above-mentioned course at Ober Gatlinburg. Pets are permitted with an additional fee. Check-in is between 3:00 PM and 1:00 AM. Guests arriving after 10:00 PM are asked to let the host know about their arrival time in advance.